This weekend we had the best breakfast that I have had in a long time! 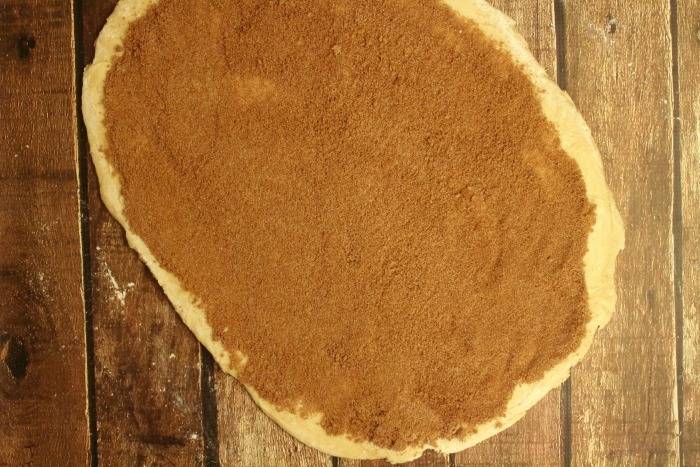 This cinnamon roll recipe bakes up light and fluffy each and every time. With the luscious cinnamon flavor and the perfect frosting, it’s like having a party in your mouth! 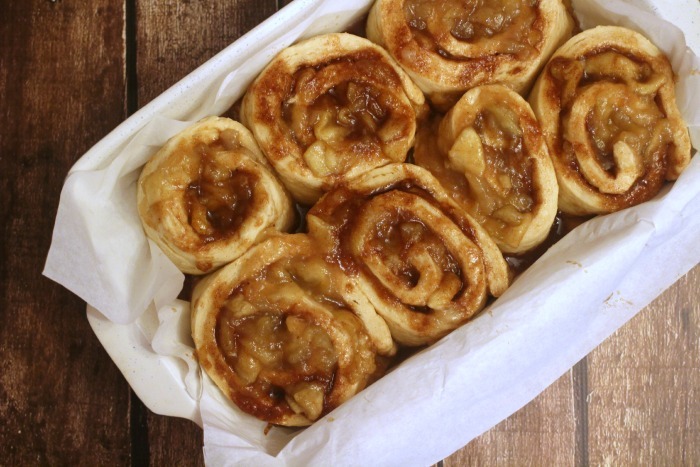 I hope you enjoy the Apple Pie Cinnamon Rolls recipe that we have for you here today. 1) Stir together yeast, water, and 2 tsp. sugar in a small bowl and allow to rise for 10 minutes. 2) In a large mixing bowl combine milk, melted butter, egg sugar and salt and mix well. 3) Stir in half of the flour and mix well, stir in the yeast mixture and continue mixing. 4) If you have been mixing with a mixer you will want to continue on from here using your hands or spoon. Slowly add in the rest of the flour and blend well. 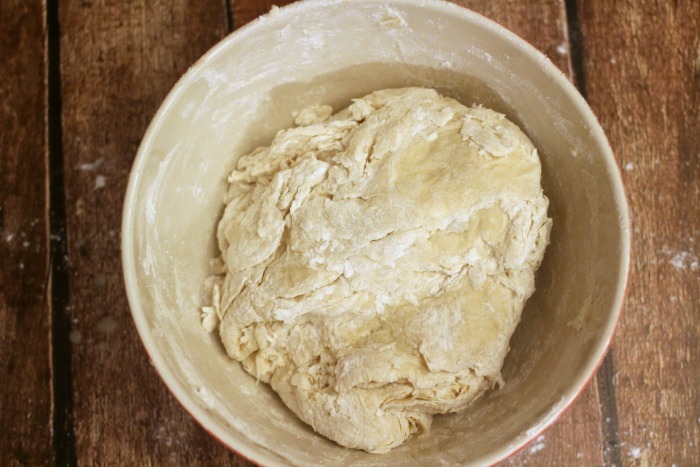 5) Sprinkle flour onto your counter top and move your dough on top of it and knead for approximately 5 minutes. 6) Place dough into a greased mixing bowl and cover with a towel. Allow dough to rise approximately 2 hours. 7) Now you can begin to prepare the apples, In a large mixing bowl mix apples with lemon juice to prevent browning and set aside. 8) Pour cornstarch into a large saucepan and slowly whisk in water. 9) Stir in the sugars, cinnamon, nutmeg and a pinch of salt and bring to a boil over medium-high heat. Once you have achieved a hard boil continue mixing for 2 minutes. 10) Stir in the apples and bring to a boil then reduce the heat to medium low and simmer for 15 minutes stir often. 11) Remove from heat and set aside. 12) Once you have reached the 2 hour time period on the dough you will want to remove it from the bowl onto a well-floured surface. Punch the dough down and prepare to roll it out. 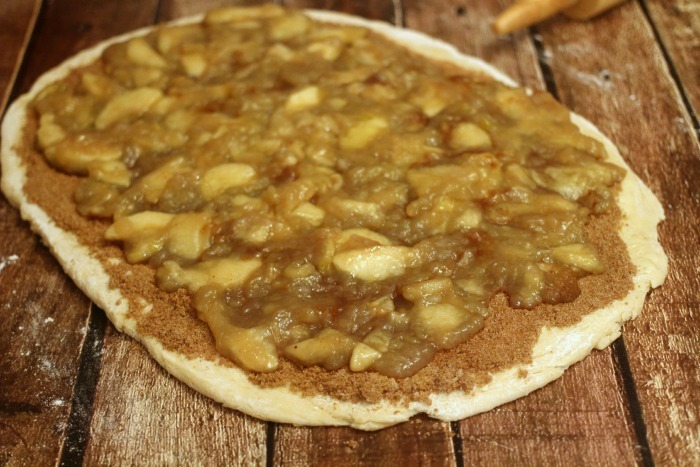 13) Roll the dough out into a large rectangle approximately 16×24 inches. 14) Spread the softened butter across the top of dough. Mix together the brown sugar and cinnamon and sprinkle on top of the butter. 15) Spread the apple mixture over the top of the brown sugar mixture. 16) Roll into a log, lengthwise: the log should be approx, 24 inches long. 17) Slice dough evenly making the individual rolls. 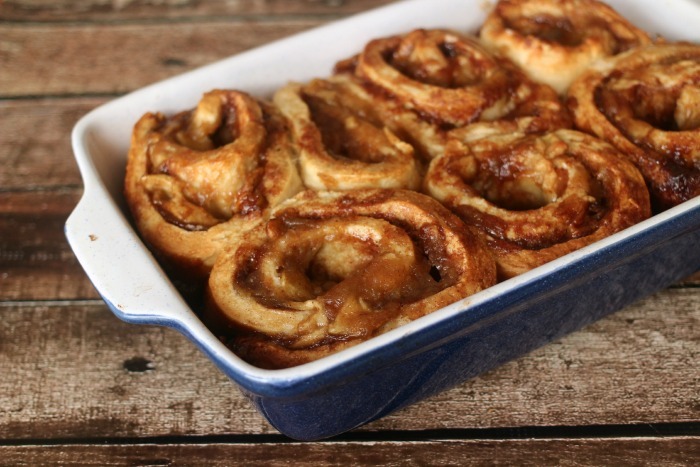 18) Line a 9×13 inch pan with parchment paper and place cinnamon rolls in the pan, they should not touch. 19) Cover with a clean dish towel and allow the dough to sit again for about 2 hours. 20) Preheat the oven to 375 degrees F.
21) Bake the rolls for 22-25 minutes until done. 22) Make glaze by mixing together powdered sugar, milk and vanilla with a whisk. 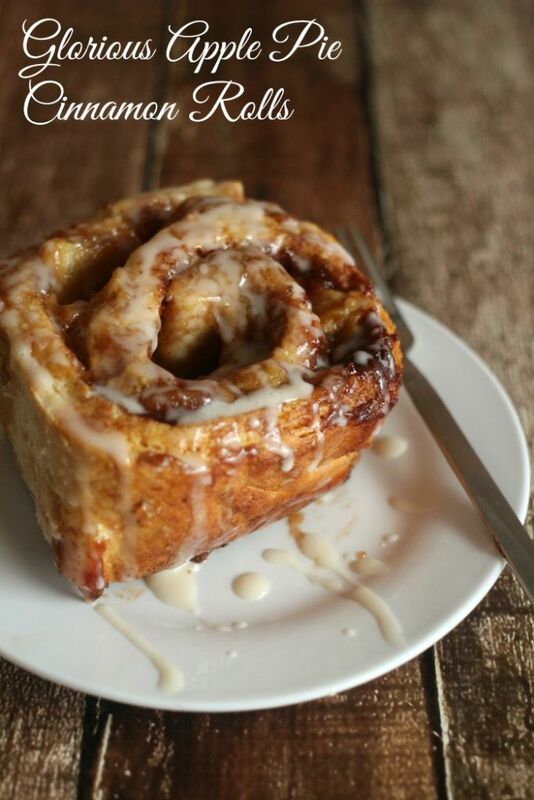 23) Drizzle glaze over the top of cinnamon rolls and serve. Stir together yeast, water and 2 tsp. sugar in a small bowl and allow to rise for 10 minutes. In a large mixing bowl combine milk, melted butter, egg sugar and salt and mix well. Stir in half of the flour and mix well, stir in the yeast mixture and continue mixing. If you have been mixing with a mixer you will want to continue on from here using your hands or spoon. Slowly add in the rest of the flour and blend well. Sprinkle flour onto your counter top and move your dough on top of it and knead for approximately 5 minutes. Place dough into a greased mixing bowl and cover with a towel. Allow dough to rise approximately 2 hours. Now you can begin to prepare the apples, In a large mixing bowl mix apples with lemon juice to prevent browning and set aside. Pour cornstarch into a large saucepan and slowly whisk in water. Stir in the sugars, cinnamon, nutmeg and a pinch of salt and bring to a boil over medium-high heat. Once you have achieved a hard boil continue mixing for 2 minutes. Stir in the apples and bring to a boil then reduce the heat to medium low and simmer for 15 minutes stir often. Once you have reached the 2 hour time period on the dough you will want to remove it from the bowl onto a well-floured surface. Punch the dough down and prepare to roll it out. 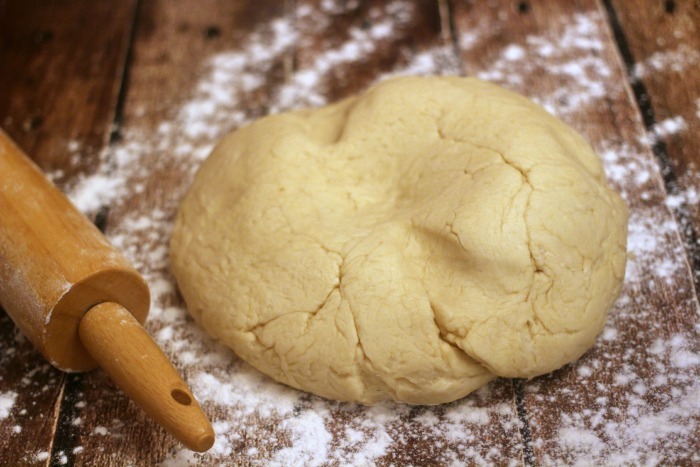 Roll the dough out into a large rectangle approximately 16x24 inches. Spread the softened butter across the top of dough. Mix together the brown sugar and cinnamon and sprinkle on top of the butter. Spread the apple mixture over the top of the brown sugar mixture. Roll into a log, lengthwise: the log should be approx, 24 inches long. Slice dough evenly making the individual rolls. Line a 9x13 inch pan with parchment paper and place cinnamon rolls in the pan, they should not touch. Cover with a clean dish towel and allow the dough to sit again for about 2 hours. Bake the rolls for 22-25 minutes until done. 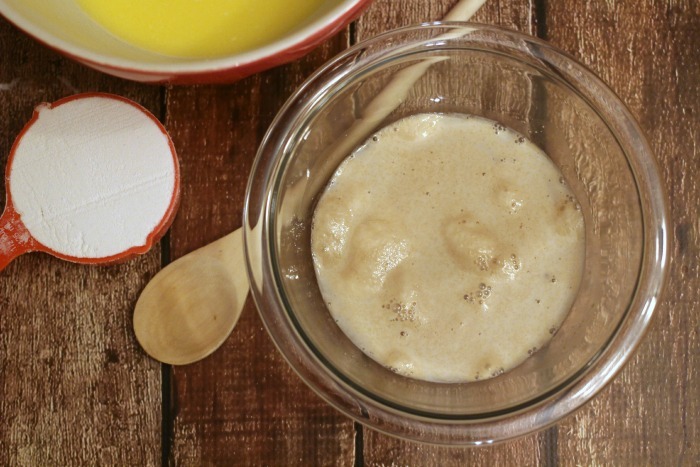 Make glaze by mixing together powdered sugar, milk and vanilla with a whisk. 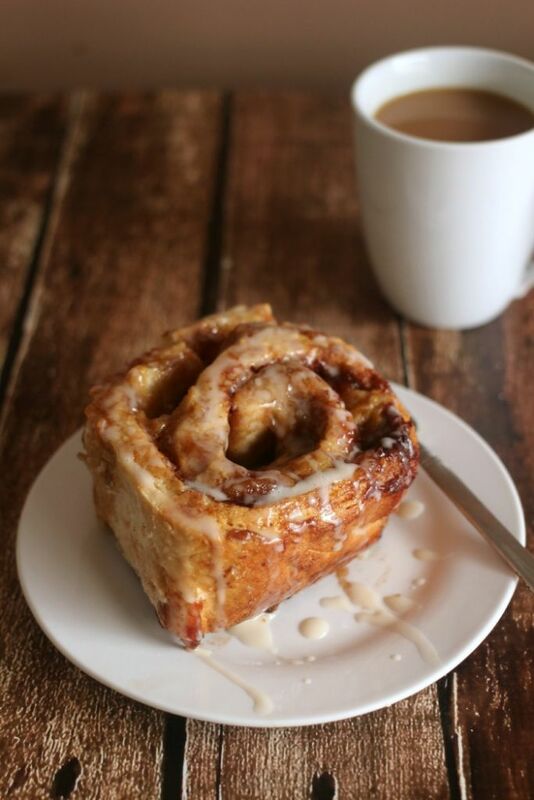 Drizzle glaze over the top of cinnamon rolls and serve. I’ve had these before and they’re amazing! Thanks so much for sharing your recipe. I’m pinning it to my Apple and my Breakfast boards. They take a bit of time to make but sure do make my family feel special! I sure hope you enjoyed them Cheri! Boy, these look yummy!! I will try these. pinned! Pinned! Can’t wait to try this recipe out! Thanks for sharing! Oh my, sweet rolls and pastry are my weakness, and you I could definitely enjoy these! I would like to grab one right out of your photo! Thank you so much for attending week 6 of #PureBlogLove and linking your fantastic blog post, I can’t wait to see what you have in store for our party next week Thursday 8 PM EST- Sundays at midnight . Your post has been added to the #PureBlogLove Pinterest board for all to see 🙂 Have a great day! I’m hoping to be able to make them Christmas morning if things don’t get to crazy! This looks AMAZING!! I’m pinning it! What an awesome breakfast treat!! Thanks for linking up with SNF! Pinned to our party board!! Wow….yummy, yummy! 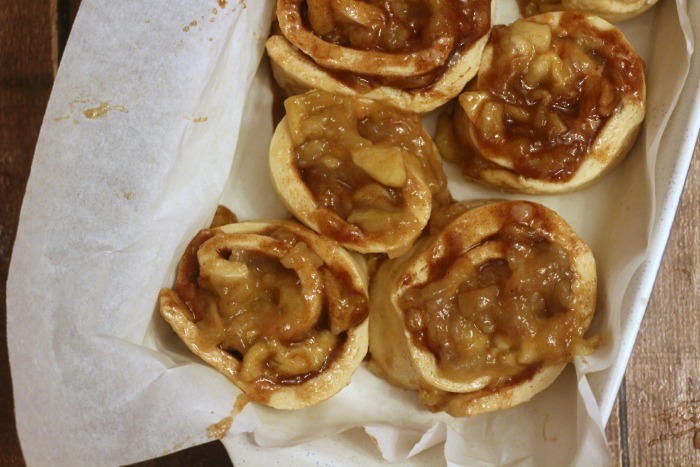 I love cinnamon rolls and apple pie so this is surely going to be divine! Thanks for sharing! PINNED! These looks sooo delicious, I can’t wait to give it a try. I always find so many cool things at your party! So much fun! G’day! Wow, these look incredible and definitely agree they are glorious! Well done! I am making these for my guests today. So far they seem amazing!